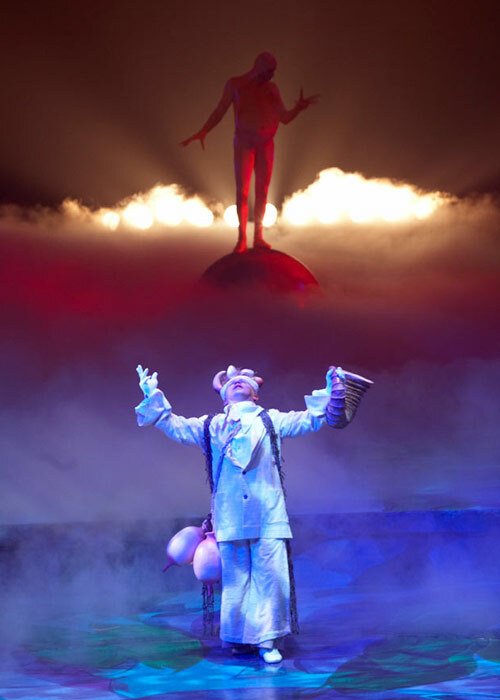 Clowing around is prominent in every Cirque show, and Mystère is no different. Brian Le Petit has come to run amok and amok he runs, but he is not the only one there: Moha-Samedi is also and, as his name suggests, no one listens to him. "Hey!" says his companion. "They don't understand you stupid." 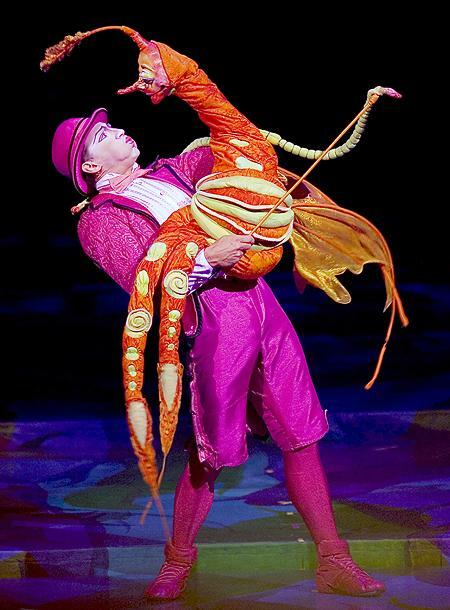 So, he sits up and clears his throat: "Ladies and Gentlemen, welcome to Cirque du Soleil!" he says. "During the performance, smoke effects will be used. You, however, can not smoke." but then, a cry from the rafters is heard - "Hey! We can see your lips moving!" It's Le Petit and he crushes the ego of the man and his puppet. Fortunately, that doesn't stop the show. For moments later, the puppet arises and speaks aloud, "He said your lips, not mine!" And then announces the coming of " MYSTERE!" 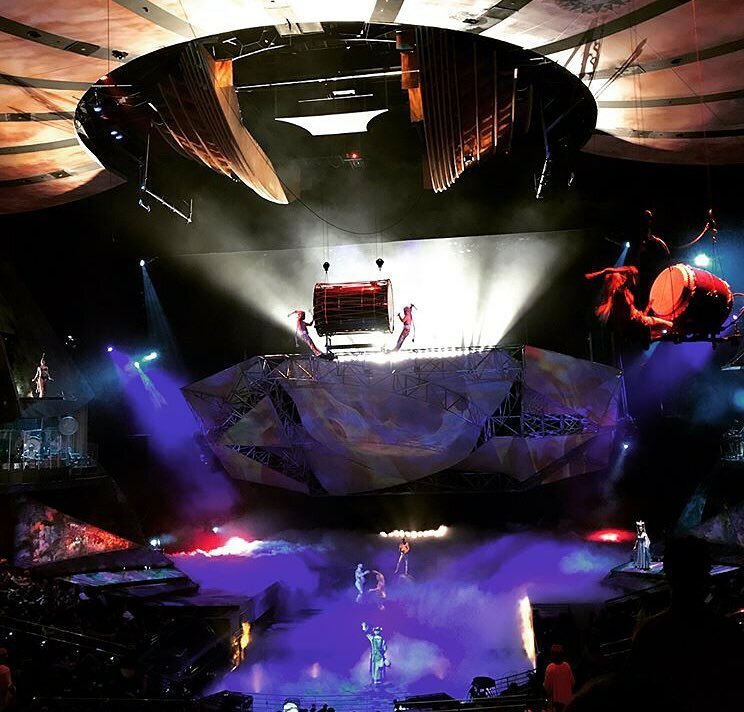 As can be heard from many of those who have lived Mystère, the show begins with a shot... or shall I say by the pound of a drum. The right-side stage door opens and a gang of fat bug-like creatures run out banging flat drums while bouncing and screaming. The "Ouverture" begins with a howling from a primeival conch shell: a human fog horn surrounded by a mysterious mist. Vocalists, adorned in flowing white robes, sing a melody line in an imaginary language that celebrates the dawning of Mystère. 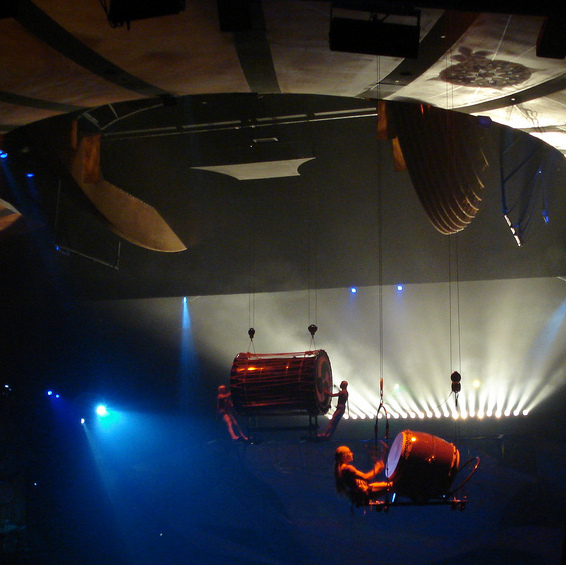 Just as the senses begin to overload, from up above four drums descend from the theatres ceiling. 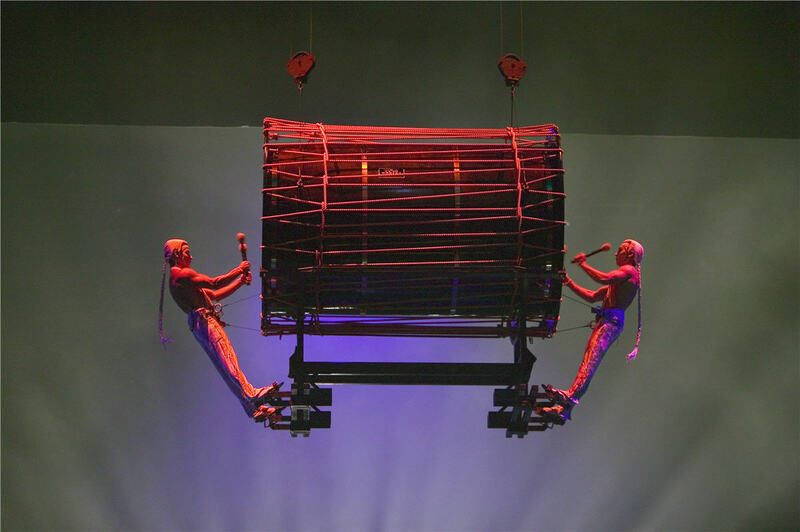 The suspended drummers, scantily-clothed and painted with fluorescent colors, pound away with body and hand rhythms reminiscent of an ancient tribal ritual. The drums call to those who inhabit these desert mountains... and they come out to play. Green lizards, red birds, and many other creatures of the desert. The band soon joins in with "Ramsani" that features a short passage of sustained electric guitar notes over a lush orchestration. Then silence; and onto a chime-laced lullaby signifying man's birth. That birth brings forth a baby, who now amuses himself onstage with a big red ball! He giggles as he bounces it around stage, but his oversize nature is not a laughing matter. For when the ball comes loose landing on an unsuspecting spectator - be warned - prepare to take on more than the roundness of the red monster. 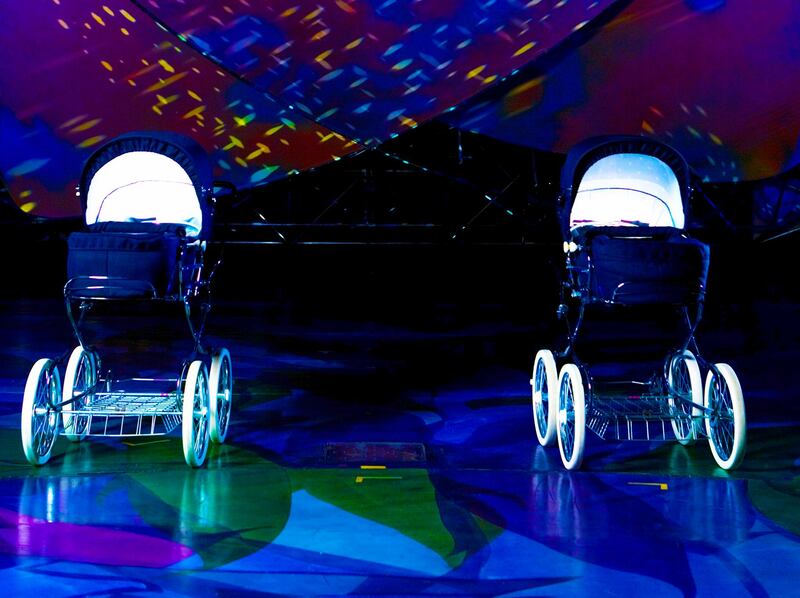 Prepare to become the parent of a very large baby!